A tool for you to prepare the CPESC exam. It just for MR900.00. Remember also our upcoming ESCP digital class to help you to get ready to CPESC exam. Our main events are back now. Due to popular demand. This event has re-called to conduct. In conjunction with Malaysian Stormwater Organization(MSO). We will be participated in the following events. These courses are strongly recommended for those had obtained CPESC certification on continuity development requirements. Our new services to the Core MSMA Suite. Due to the popularity of our digital MSMA-Core MSMA Suite, the digital classes will be conducted to provide a better understanding on MSMA guideline with our Core MSMA Suite. It will help our users in implementation of MSMA in design world. These classes will be conducted in first come, first serve mode. Furthermore, and most important is FREE of charge. Priority to be given to our clients. Digital classes are subjected to change without prior notice. Interested! Please register in advance to reserve seat. Visit here for our past Events . Our products development cannot move without industrial collaboration. Besides, industrial partner such as G&P Water & Maritime Sdn Bhd. Now, we also move into education level which based on our skill and knowledge, we can help our education to move parallel with industrial. It will further enhance our products quality. R&D and joint development with our reputable universities in Malaysia such as UPM and UNITEN. Stay tune. More news coming..
We are please to annouce that we will release our 1st printed engineering books in year 2019. Software cannot come without technical write up. This will be our path to serve communities better. As we understanding, there are limited resources on the engineering books in real practical aspects. With more than 10 years in software market, our experience more than 20 years design experiences, more than 8years past events feedbacks, our clients comments, this is where we can produce an enrich contents on technical write up from theories up to practicality issue. The Essential of Earthworks Book will comes with a complimentary Classic edition of ZeonEarth-Our signature 3D Earthworks software. We will inform you once it is official release in early of year 2019. The final content of books will subjected to change without prior notice. We have been developed civil and structural engineering software since 1994. In year 2006, we started introduce our engineering products in Malaysia market. Til now, it has been taken more than 10 years in market and more than 21 years in civil and structural software development. Currently, we have large clients based especially in civil and structural consulting engineers. Til today, we have been sold more than 3000 copies of software. In order to help our customers-civil and structural engineers, we will keep on developing new applications, enhance and update existing applications. Through the time, we will release new products and updates for any existing applications. From now onward, we will be concentrated our manpower to our main development team. With this move, we will able to delivery better engineering products development in term of qualities, values, knowledge and productivity; where we can meet our vision below. Our anticiptape products for year 2018. X Series. Infrastructure applications. xStorm, xDrain, xSewer and xWater. Next generation products which now support open source software. Therefore, we have a number of productivity products which has been group into such as Storm package, CAD package, Civil engineering package and also structural package. CAD package mainly run in Bricscad platform. Now our new xBrics, ZEON EARTH and VIEWER-can run in Bricscad platform version 16. xBrics is land surveyor CAD utilities, ZEON Earth is an earthworks computation and ZEON Viewer is 3D terrain generator. Storm package is the apps that mainly in stormwater. Civil engineering package is the apps for earthworks, water supply, drainage and sewerage. One new modules IntelliDrain Preview is going to add into core MSMA suite 2018. Two new modules added to core MSMA suite 2018. iDesign and EcoPlant. xCAD Version 2.0. CAD utilities up to 73 modules. Aquator addon updated guildeline for SAJ. Tank modeler with new template. 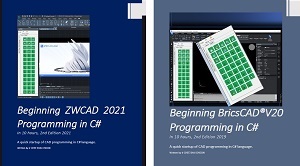 Bricscad CAD Programming in C# or VB.NET book. Visit here for our previous Events .